One of the greatest things about the internet is how easily you can get information about a product before actually shelling out your own hard-earned money on it. When it comes to the #menswear game, you can find thoughts on everything from fit to comfort written up by someone else who either swears by a product or wants to let you know how crappy it is. I'll be the first person to say I've seen something look good as hell online and wanted to buy it and then either read a review or talked to someone who did and they tell of random threads unraveling, buttons falling off etc. That being said, another great thing about the internet is the fact that it's made it a lot easier to connect with people and brands that are doing some pretty dope things. Every so often, I'm fortunate enough to be asked to try something out and give feedback on it or I come across something that I don't mind paying for because I support what the brand is doing. Doesn't always mean that I'll like it once I get it in my hands, but I'll speak the truth in love. While a product may be sent to me at no cost for consideration/review, this has no impact on the opinion I share. However, I believe it is only right to be upfront about the fact that I did not pay for some of the items I review and that I only review items that I would personally use and pay for. Most would agree that social media has made the world a much smaller place. As someone who finds himself inspired by European style, particularly the classic British tailoring houses of Savile Row and what I consider the "Art of Sprezzatura" that has made its way into the #menswear lexicon thanks to Italians such as Lino Leluzzi of Al Bazaar and Nicola Ricci of Sciamat, the internet has made it quite possible to connect with a number of individuals and brands that I admire beyond "likes", "re-tweets" and "re-blogs". One such brand is Daniel and Lade - Bespoke Atelier. While I admittedly spend what some would consider a shameful amount of time scrolling through pictures on both Instagram and Tumblr, it can sometimes yield some beautiful relationships. I came across a picture of a stunning pair of loafers one day and clicked through to their main page. I liked what I saw so much that I reached out by email to Daniel Orija, one of the minds behind the brand to discuss a potential partnership. Based in London, one of my favorite cities to visit, run by a fellow Nigerian and Christian man, the connection just made sense. In a day and age where there is a proliferation of online made-to-measure "companies, it was refreshing to come across one that not only has a legitimate vision around helping men dress better but also believes in bridging the gap between affordable and luxury. The bespoke online 3D platform is one of the most fluid that I have seen in my research, and trust me I tried a bunch of them out to compare. 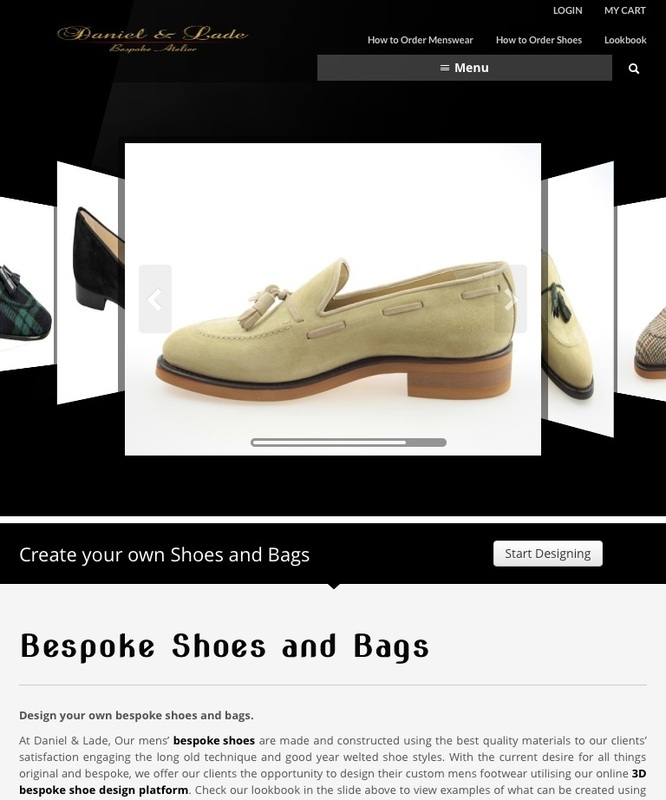 Daniel and Lade's platform allows you to design everything from various shoe styles to fully customized suits and blazers, both on your computer and on the go using an app on your iPad or smartphone. I got an opportunity to design both a pair of shoes and a jacket using the platform and was quite impressed with the variety of options. 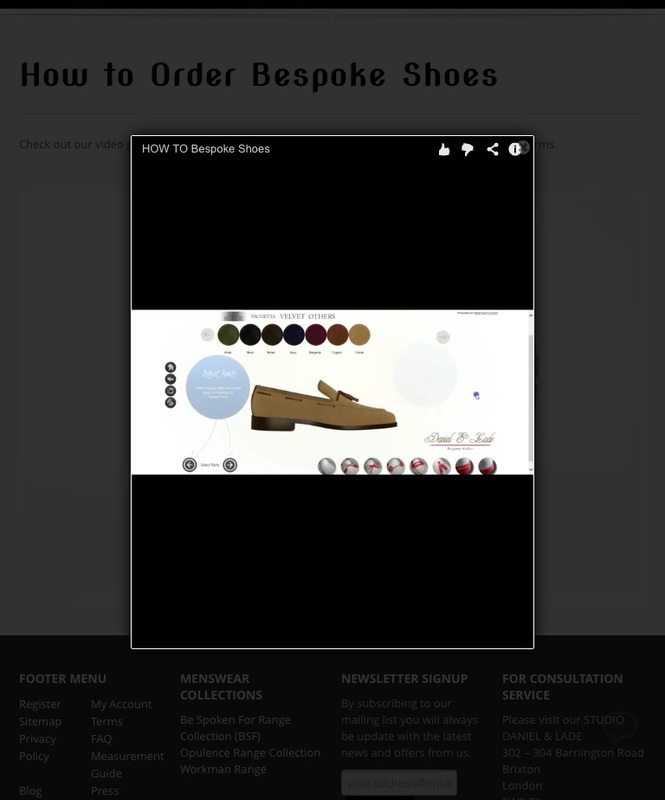 The platform gives you the ability to select everything from tassel style, and sole color for your shoes to the type of buttons and thread color used to attach them for your jacket. Daniel and Lade offers standard sizes on the shoes and the ability to enter your specific measurements on your jackets. 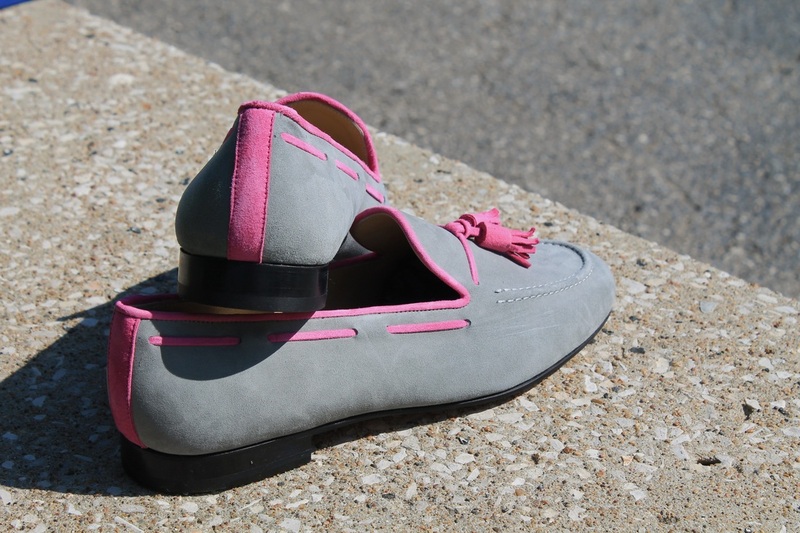 For my first custom shoe order, I decided to create a bold tassel loafer utilizing grey suede with fuschia tassels and piping. Afterall, a huge part of the value proposition of bespoke footwear is the ability to create something that is completely unlike any other and these definitely hit the mark. Hand-made in Spain, after completing my design and submitting my order, the shoes took about a month to arrive, which for a custom design is more than reasonable. Well packaged with bags to store them in, the fit was spot on out of the box. I know this sometimes is a concern when dealing with European sizes, but no issues here. The lustre of the suede used is beautiful and pressing a thumb into the shoe was just a teaser of how comfortable they were once I slid my feet into them. In thinking through the entire experience, and considering some of my other made-to-measure experiences, this was without a question one of the best I have had the pleasure of going through. Being able to select virtually every minute detail of a piece and see it mocked up in 3D changes everything and as long as you get your measurements entered in correctly, I find it hard to believe that you wouldn't be satisfied with the outcome. As I mentioned earlier, I also got an opportunity to design a jacket utilizing the 3D platform. My initial thought was to create something that would complement the shoes nicely and the consistency in the modelling and color availability on the platform really supported that. I'm definitely looking forward to that and will update this review once it arrives. In the meantime, I've teamed up with Daniel and Lade to provide readers of the blog the ability to design and get up to a 40% discount off a pair of shoes of their choice. The first ten readers to follow and like Daniel and Lade on Instagram, Pinterest, Twitter and FaceBook (10% per social media platform) would be eligible for this offer. Once done, send Daniel and Lade a direct message on FB or IG with your name and email address, and you'll receive your discount code shortly after. Trust me, this is a huge deal. Don't ever say I never gave you nothing. If you have been following this blog for a while, you may have noticed that I have a strong preference for the cutaway collar on my dress shirts. The range of opinions on cutaway collars are as widespread (pun intended) as the number of #menswear forums populating the great interwebs. Anyway one day, about a year and a half ago, I came across a photo on Tumblr of a guy wearing what I later learned was a Trashness extreme cutaway collar shirt. 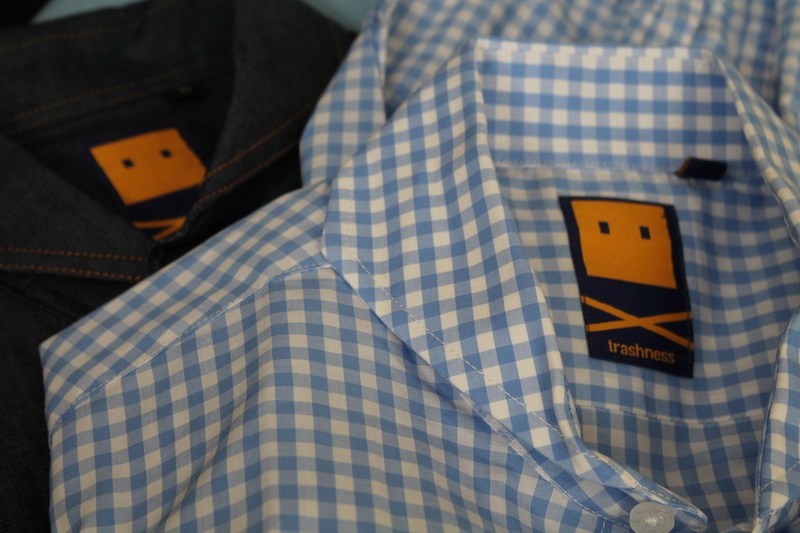 Founded in 2010 in The Netherlands by two friends, Amin Eftegarie and Maarten van Damme, Trashness began as a menswear blog and eventually expanded into the production of shirts, ties, etc. Shortly after I came across that picture on Tumblr, I placed my first order for the Extreme Cutaway Classic in a size medium (because I wear a medium in everything right?) When the shirt arrived, I couldn't get it on and so went back to the Trashness website to see what went wrong. I actually credit this experience for causing me to learn about measurements which the guys had so kindly provided on their website and I failed to check before placing my order. They even include a tutorial on how to measure a shirt. After getting my measurements in order and comparing them to the size chart, I realized I needed a large. Upon receiving the shirt and trying it on, the first thing I noticed was how amazing the fit was. This is saying something for an off the rack shirt because I have something of a slight belly. It was perfectly slim without being tight and the quality of the 100% cotton oxford cloth was far superior to anything I could have expected. Usually with off the rack shirts, you get some sort of billowing at the sides or in the sleeves, maybe a bit of collar gap. None of that here. At $38, it immediately became my favorite shirt from a fit and material perspective. One thing that could have been a deal-breaker was the Trashness logo embroidered on the abdomen, however the location is so discrete that its almost impossible to notice unless the wearer wants you to. After that, I kept an eye on the Trashness website and have since added the gingham, denim and salmon linen versions of the cutaway to my closet. Not too long ago, I noticed that a white 100% cotton version of the extreme cutaway had been added to the store and picking it up was on my radar when I received an email from Amin asking if I would be interested in taking one of their shirts for a spin and doing a write up on it. Needless to say, his timing was perfect and within a few days, I had the shirt in hand. Once again, the fit on the white shirt was absolutely spot on. This time I went over the shirt with a fine tooth comb in preparing to write this review. Trashness strikes me as a no-bull type of business in everything from how they handle shipping of their product to how they run the blog. They offer free shipping world-over with the option to spring for expedited shipping and got to love some of the responses to their FAQ's such as - "Something I want is out of stock - "Thats too bad. We might restock it, then again, we might not. 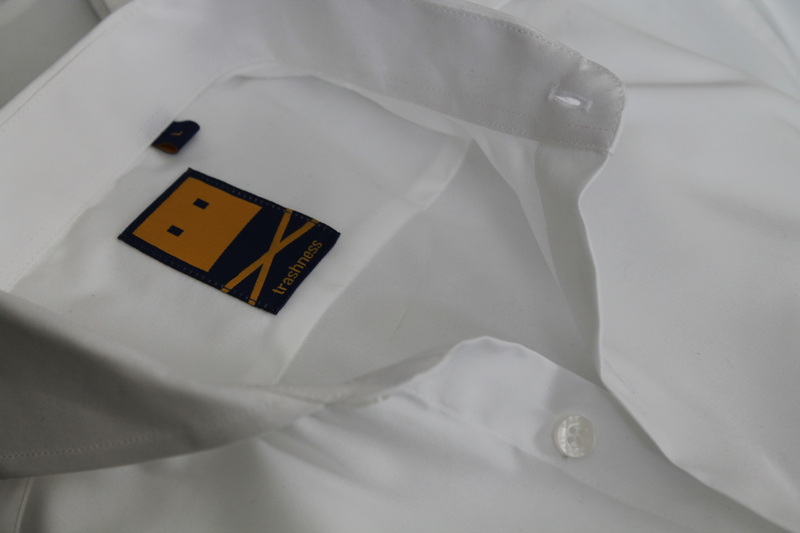 Please email us to notify us about demand, we listen to our customers carefully..."
The cotton fabric of the white shirt is smoother than the oxford cloth used in the classic but I find that makes it a bit more versatile to wear as well. While the buttons are plastic and engaraved with the Trashness brand, they are nice and thick and solidly sewn on. The collar holds its own without a need for collar stays which is a huge plus in my book. Point here is, you get a no-bull, solid quality shirt for anywhere from $38 - $44 depending on which one you go with and you don't have to deal with any silly advertising or spam to get a good deal. Now to get my hands on that olive five-fold tie huh? First time I heard about the "Netflix of Ties", my initial thought was "fair enough." Then I got an email from Dave over at FreshNeck and eventually we got an opportunity to chat on the phone and the brand's concept went from having my attention to being intriguing. Dave was kind enough to hook me up with a complimentary membership and with the arrival of my first set of items, the brilliance of Freshneck became clear as day. The FreshNeck concept allows members to load up their queue from the huge selection of designer ties, bowties, pocket squares, cufflinks etc. The top items from the queue are then sent out from the warehouse and in 1-3 days, the mailman is dropping off some good in your mailbox. Wear whatever you get for as long as you want and then when you are ready to swap out for something new, mail the items back in the prepaid envelope that comes with your order and wait for the next item(s) in your queue. Simple and brilliant. Mind you these aren't your 'run to Macy's' and buy on sale for $19.99 ties. The first three items I added to my queue were a linen/silk blend Faconnable tie, a linen Edward Armah pocket round and a linen Armstrong and Wilson pocket square. Upon arrival, I was pleasantly surprised to find a complimentary pair of brass collar stays included in the envelope. With memberships starting at $15 a month and the ability to buy items that you've rented at a discount, FreshNeck is a great idea for the man who wants the best but doesn't necessarily want to shell out up to $200 for a tie. Even though this was my first time, it definitely won't be my last. I recommend checking them out here. So, a number of years ago, my little brother who studied in Europe told me about this place called Suit Supply. Well living state-side, it really didn't mean much to me because they didn't have a presence here. Fast forward to 2011, they open their first store in New York. Again, no real significance to me since I live in the midwest and I wasn't really interested in buying suits online since I couldn't try them on, feel the fabric etc. I however did continue to follow what they were doing and gradually became more and more impressed by what I heard and saw online and was really attracted to some of the fabrics I was seeing. This past weekend, my wife and I stopped by my brother in law and her sisters place and eventually the conversation between my brother in law and I turned to menswear and suits specifically. A couple of drinks later, somehow we had decided to drive down to Chicago the next morning and spend the day and night there. Of course, it was inevitable that we were going to check out the much hyped Suit Supply even though neither of us was specifically in the market for a new suit at that time. Upon walking in, I immediately dug the aesthetics of their top floor space. Being Chicago in March, it was cold as hell, so checking out the balcony was out of the question, but there was more than enough to look at inside. Literally racks on racks on racks of suits as well as jackets, shirts, ties, shoes in pretty much any size one would reasonably expect to find in a store like this. Also, off in the corner, a seamstress doing on the spot alterations. More on that later. According to Suit Supply, they combine craftsmanship with flair and after experiencing their product first hand, I have to say they hit it spot on. From the first jacket I tried on - a plain double breasted khaki joint in plain cotton to a number of suits that immediate went on my "want" list, their attention to expert tailoring and fit was obvious. Being a member of the instant gratification generation, I really appreciated the fact that I could walk in, decide on a suit that would fit extremely well off the rack without being pressured by sales people (even though it was clear that the guys there knew their sh*t), get whatever minor alterations done on the spot and rock my new suit that night if I needed to. Suit Supply lives up to every bit of the hype and more, so for every normal guy who is looking to buy a new suit, here you go. You of course have the option of heading off to your local Macy's and buying something nice and boxy, or you could hit up Suit Supply (in person if you have one) or the website and get your hands on something with natural shoulders, hand-sewn lapels, half- or full-canvas construction and made with fabrics from some of the finest Italian mills such as Vitale Barberis Canonico, Angelico, Cerrutti etc., starting around $500 which is extremely reasonable for for what you are getting. Not too shabby for a business founded by a Dutch student in his dorm room. After following each other for some time on Tumblr, where I became a fan of his blog - Introducing Mr. Bentley and then on Instagram, I connected with Ryan D. of The Gentleman Bentley and we got to chatting about his most recent endeavor; a line of boutonniere's that are customizable to the desires of the orderer. He had become aware of my fondness for lapel flowers and pins and wanted to offer me a chance to try one of his products out for size. While I was initially hesitant due to my concern about the size of the boutonniere's in relation to my preferred suit lapel size, I agreed to give it a shot. We exchanged a few emails about what I wanted and what I discovered was that while I was probably not his most demanding customer in terms of requirements, he was very accommodating in terms of hardware color, size, pin cap style etc, which I imagine he is with all of his customers. I ultimately elected to keep it simple after considering what I already have in the way of lapel flowers and pins and went with a solid grey flower, silver tone hardware and pin cap. About four days after we exchanged our last email, I received my boutonnière in the mail. Considering that they are hand-made to order, I was pleasantly surprised. Also, I remembered that I was not very specific about what shade of grey I would have liked for the flower, and so I was even more pleased that it was a nice thick, heather gray which I favor over charcoal etc. After opening the box, it became clear that Ryan wants to ensure that unwrapping their boutonnière is an experience for his customers. From the hand-written note in an envelope with a wax seal to the purple paper wrapping the ribbon bow-tied velvet box containing the boutonnière itself, it's almost like Christmas. Measuring 2.5", 3.5" including hardware, the flower for the most part maintained its shape through the shipping process with only a slight "mushing" at the top. Included in the box were instructions not only addressing how to get your flower to "bloom" fully either by letting it sit for a while or fluffing it gently but also how to care for it. As I was initially concerned about, the boutonnière was indeed larger than I would personally comfortably go for on a jacket lapel, but I liked it so much that it wasn't long before I realized it was perfect for a coat lapel and for that matter the very coat I was wearing that day (see here for more). I am particularly a fan of the fabric that my boutonierre was made of as it was a thick and seasonally appropriate choice. In a day and age when men are becoming more aware of how we dress and looking to elevate our attire choices with the right accessories, The Gentleman Bentley boutonnière's provide an excellent option and value. The Warby Parker Experience - How I actually discovered Warby Parker, I don't exactly remember. Instagram, twitter, one of those social networks. Anyway, I ended up on their website and immediately got drawn in by their story, which is essentially delivering top notch eyewear without extorting the hell out of those of us that blindly scramble for our glasses as soon as we wake up in the morning. Even more interesting, they allow you to pick five pairs from the site for an in-home trial, an idea I really like and apparently is already being imitated by some larger eyewear companies (read: glasses.com). They ship the glasses to you and give you five days to try them out before shipping them back. Being the sometimes indecisive person I am, I placed my at-home try on order and then ten minutes later decided I wanted to swap one pair for another. Unfortunately, the website doesn't allow you to do that once you place the order, but I picked up the phone and the very nice rep that answered the phone hooked it up for me. Fast forward: Trial glasses arrive and right off, I'm impressed. For people who wear their fingers out clicking refresh on shipping tracking pages, they ship by UPS 2-Day. I take them out of the box and the clear sleeves they were packed in and can immediately feel the quality in the materials used in the construction of the glasses. After trying them on, I settle on the Begley (pictured above left) for my glasses and the Jasper (pictured bottom left) for my sunglasses. Armed with my prescription, I headed to the computer and placed my order. Entering your prescription is a very simple process and they even offer the option to contact your eye doctor to verify your prescription. According to their website, every pair of Warby Parker glasses is custom fit with anti-reflective, polycarbonate prescription lenses with frames made from custom cellulose acetate and ion-plated titanium produced specifically for Warby Parker. Acetate frames are cut from a single sheet to ensure color parity, then polished at least twice for a minimum of twn days to ensure a lasting finish. Titanium frames are individually laser cut and finished with ion plating for colorfastness and durability. Warby Parker also is a company that believes in "doing good." For every pair of glasses purchased, they provide a pair to someone in need. My glasses arrived separately a day apart (looks like they were shipped from different locations) about a week after I ordered them. Again, I dug the packaging and immediately tried them on. There was some sort of white rubbery residue around the lenses on the sunglasses, which I assume was from whatever it is that is used to make sure the lenses fit in the frames just right which I had to trim off, but this was and has been the only "con" if you can even call it that. The frames stay on with no slipping like I was fitted for them at my eye doctor which speaks to the quality of the materials used.